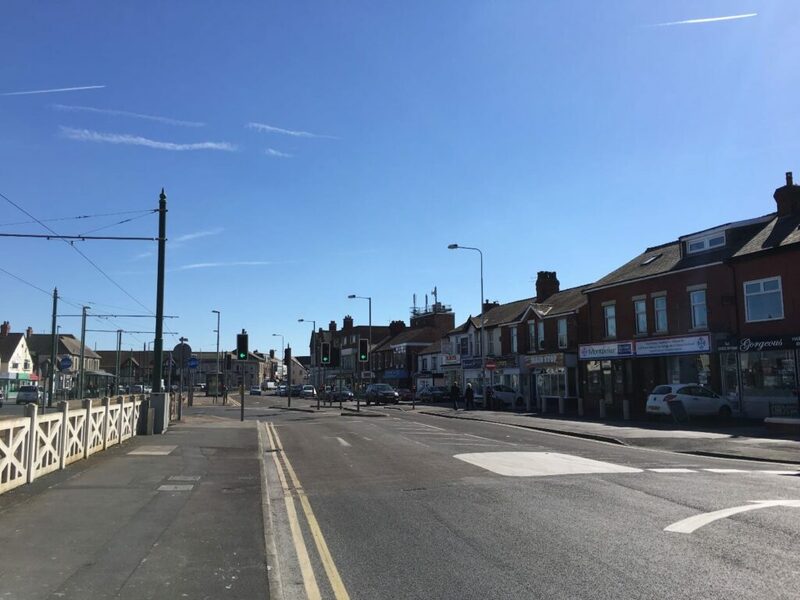 Find Cleveleys town centre between the sea front and the Blackpool to Fleetwood tramway and beyond, for a great mix of local shopping by the sea. 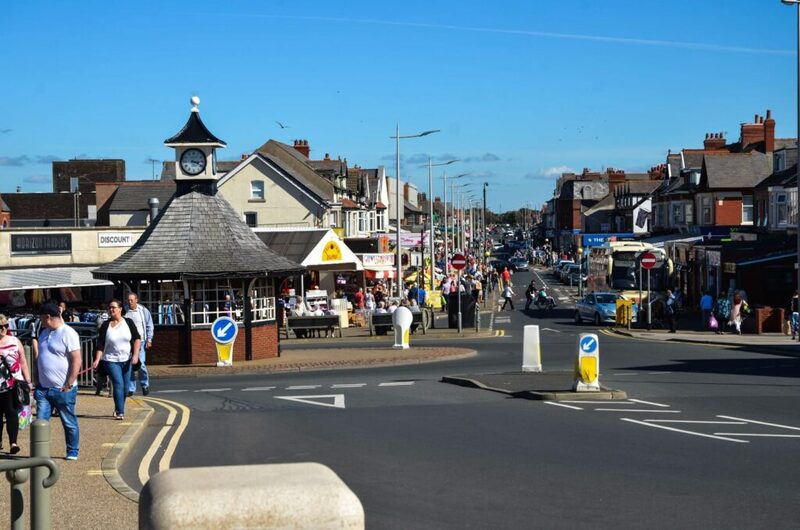 Cleveleys is one of the best places for family friendly shopping by the sea. You’ll find a really good mix of shops all close to each other, without having to walk a long way between shops, like you would in some town centres. 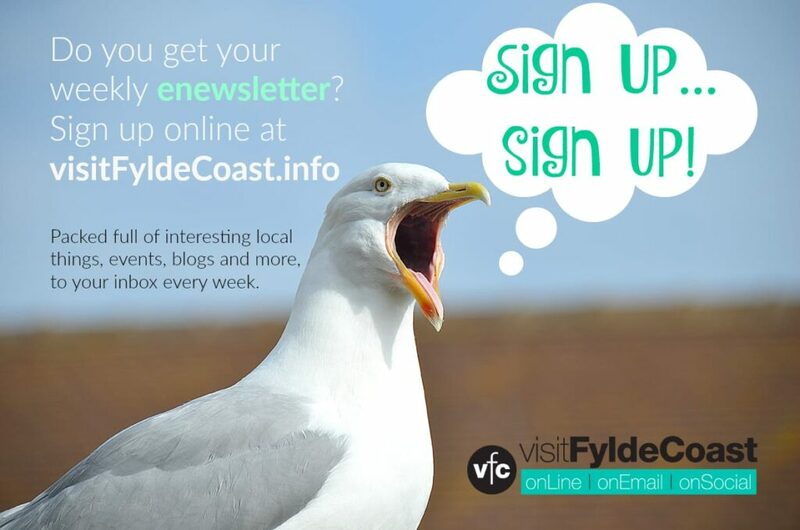 In Cleveleys town centre you’ll find national names, side-by-side with local independents. Visit a really good mix of shops which includes clothes, food retailers, supermarkets, furniture and homewares. We’ve got independent butchers, bakers (sorry – no candlestick makers! ), cheese shop, fishmongers, fruit and veg, and many more. In common with many town centres we have our share of charity shops in Cleveleys. However, they’re all excellent quality. Well presented and well stocked they’re somewhere to bag a bargain, help a good cause and put unwanted possessions to good use.  They’re very popular with shoppers – in fact they’re a visitor attraction in their own right! You can actually sustain yourself quite nicely with the shops at Cleveleys if you can’t, or don’t want to go elsewhere. There aren’t many small town centres that can still say that! Cleveleys town centre is a great place to watch the world go by. The main section of high street has a wide pavement with plenty of benches and there are lots of pavement cafes too. It’s a friendly place, so if you sit down you can bet you’ll end up chatting to someone! There are often street entertainers and buskers playing in the town centre which makes for a nice atmosphere, especially on a sunny day. 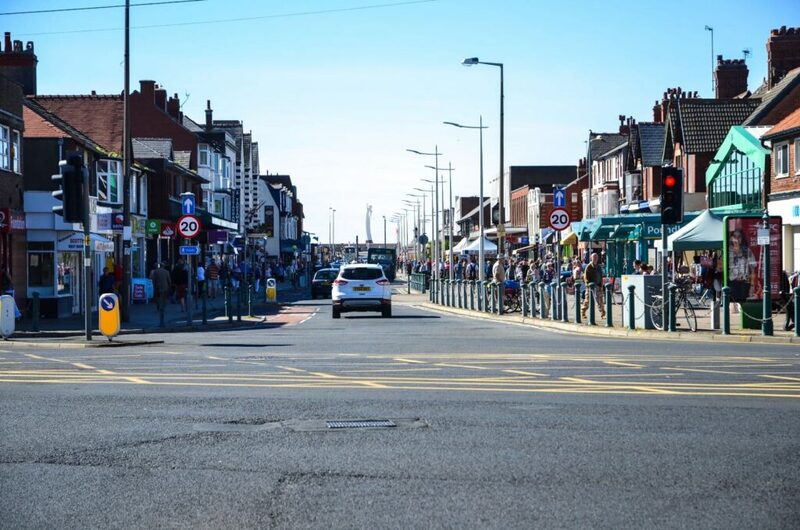 The main shopping street in Cleveleys town centre is Victoria Road West. It runs at right angles from the promenade, intersecting the tramway at Victoria Square. Victoria Road West continues as far inland as the big roundabout. That’s the junction for Morrison’s supermarket, Victoria Road East (to Thornton), Fleetwood and the A585. Victoria Road West begins at the promenade at the clock shelter (below). This is near to the open space on the promenade at Cleveleys seafront, known locally as the Plaza. There are shops along the main road, along the tramway and the side streets which join Victoria Road West, on both sides of the road. Click here or on the map below to open it in Google maps. 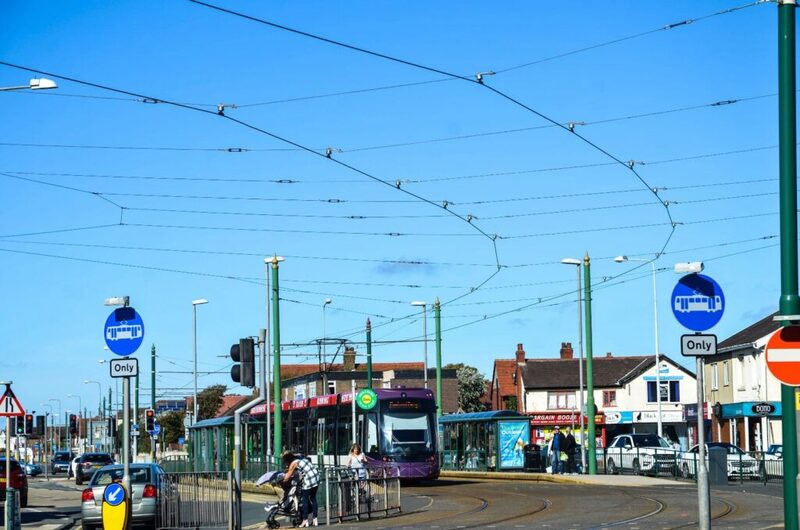 Victoria Road West crosses the tramway at Victoria Square – it’s right in the centre of Cleveleys (below). Pass through Victoria Square, right at the heart of Cleveleys town centre. The sea is just at the end of the road! Crescent East (leading to Kelso Avenue) and Rossall Road are the two approaches into Victoria Square alongside the tramway (below). You’ll find shops along both sides of the road here too. Rossall Road in Cleveleys town centre – the tramway is at the left behind the concrete fence. 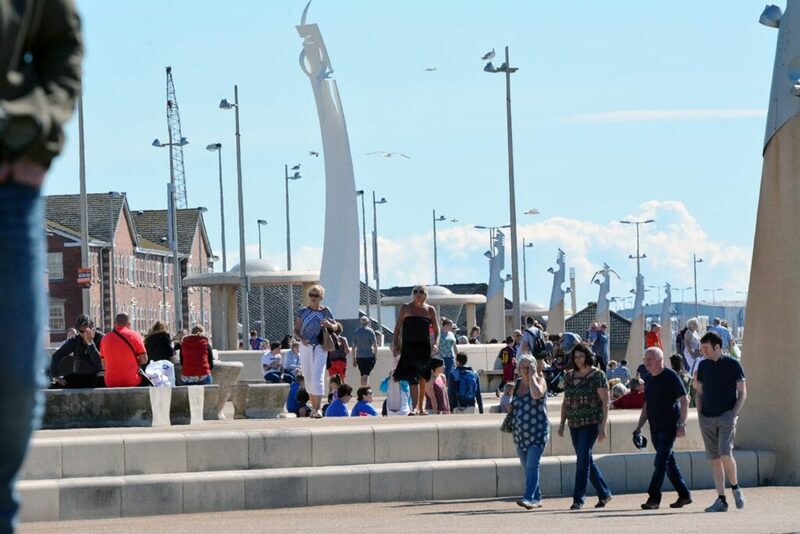 When you’ve finished in the town centre, enjoy a lovely stroll along the sea front and beautiful promenade. There are a number of short and long stay car parks in Cleveleys. On Rough Lea Road there is a short stay car park. There are two long stay car parks on Derby Road, straight across from the bus station. There is free (but limited) on-street parking all over the area, both on side streets and on the promenade. Cleveleys bus station is just a few yards walk from the centre of Cleveleys, near to B&M. Public toilets in Cleveleys are single cubicle-style, managed by Danfo and cost 20p to use. Find them at the car park on Rough Lea Road, at the bus station and the promenade at the cafe opposite Jubilee Gardens. 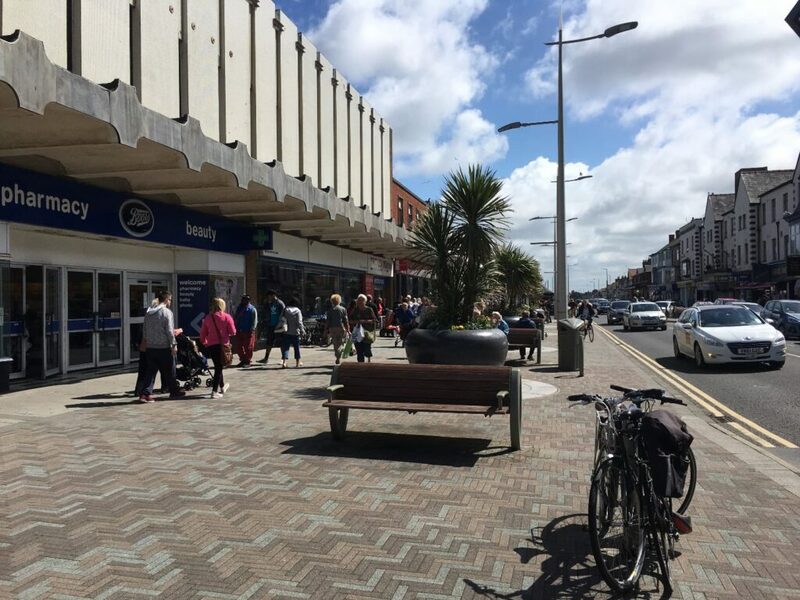 Cleveleys was awarded a £10,000 government grant in early 2017 to establish a Coastal Community Team. A small group of volunteers are working hard to improve our town centre and make it better than average. They have improved the appearance of the town centre, instigated a weekly market and brightened up the bus station. There’s an amazing sense of community spirit in Cleveleys. Local people love their town, and tourists love to visit. You can feel the warmth of the place when you shop here – people are friendly and welcoming. 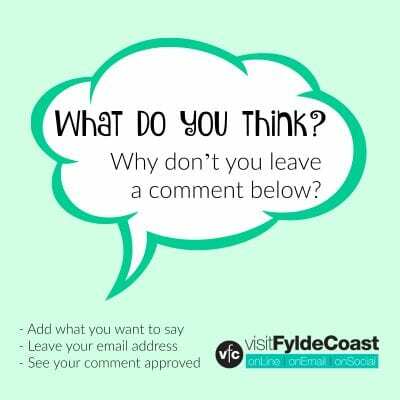 You can keep up to speed, and get involved, by joining the ‘Care for Cleveleys’ Facebook group. 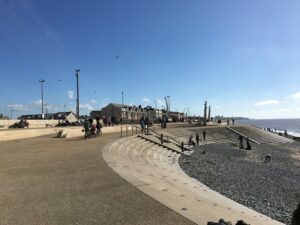 We always enjoy coming to Cleveleys as a visitor, but my wife is in a wheelchair and finds it more and more difficult due to the uneven paths. They are in a disgusting state, no level dropdown onto roads – too much of a drop. Slabs 2in above another. If you want a lift around in a chair to see, I can oblige. Council needs to spend money for people who don’t walk.